On this day in 2001, the World Wrestling Federation aired an episode of their weekly TV show ‘WWF Sunday Night HEAT’. It was broadcasted from the MCI Center in Washington, District Of Columbia and featured pre-taped matches, interviews & storyline segments on the road to the ‘WWF WrestleMania X-Seven’ PPV. Only 4 episodes of RAW are left before WrestleMania 35 and tonight’s post-FastLane 2019 episode of RAW is going to be a big one. What will happen when Triple H comes face-to-face with Batista? 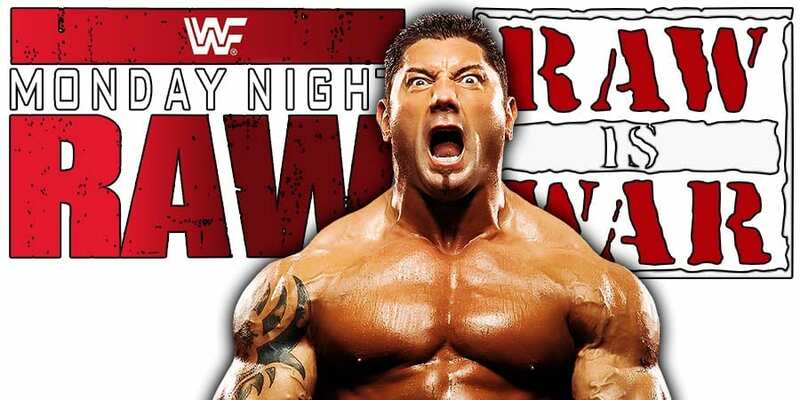 “Tonight on Raw, Triple H will stand face-to-face with Batista, two weeks after The Animal made a shocking return to attack WWE Hall of Famer Ric Flair to get The Game’s attention. Where will Reigns, Rollins and Ambrose go after The Shield’s last ride? “Roman Reigns, Seth Rollins and Dean Ambrose triumphed over Baron Corbin, Drew McIntyre and Bobby Lashley in The Shield’s last ride at WWE Fastlane. It’s been said that when a door closes, another opens. What will that look like? Also, Finn Balor will defend the Intercontinental Championship against Bobby Lashley. According to Rajah, WWE Officials are considering taking Renee Young off the commentary table on RAW. No other information is available as of now regarding this. For those wondering if this move could be related to Dean Ambrose’s WWE departure, then that might not be the case as FOX wants WWE to have a two person announce team for SmackDown, so it’s possible WWE could be doing the same for the RAW commentary team as well.